Being stylish and being one step ahead of the trends does not necessarily mean you need to spent a fortune on fashion and beauty products. You can buy womenswear, menswear, beauty products and more from a range of premium brands receive up to 70% discount with Brands Exclusive. Calling themselves your number one style destination, Brands Exclusive offers their members designer pieces with up to 70% off. Membership is free and with no obligations. However, you need to be over 18. Once you sign-up with the exclusive go-to destination for the style-savvy shopper for free, you’ll be offered premium products regularly. Sales periods last approximately from 4 to 7 days. All the brand products are genuine and sourced directly from the manufacturers or distributors. That way you’re always getting the real deal! Due to Brands Exclusive’s own statement, exclusive prices of the shopping club are made possible by close partnerships with the brands and by not stocking inventory and thus, by saving warehouse costs. The savings are then passed directly to you. Save no even more with our Brands Exclusive promo code. Redeeming your coupon code is easy. Just copy the desired code from our promo code list, and hit the button that leads you straight to ExclusiveBrands.com.au’s website. Once you’ve filled your shopping bag and proceed to checkout, you’ll see an empty field asking you to enter your promo code there. Hit Apply and you’re all done. Shopping starts with picking either of the two main sections: Fashion or Living. Footwear, simwear, bags and accessories, make up, hair styling products and many more fashion items can be browsed in the Fashion section. Refine your search by choosing one of the sub-categories like Women, Shoes & Accessories, Beauty, Men, or Kids. A little confusing, but still listed under Fashion, you can also shop for wine and browse warehouse sales. Everything household and lifestyle, you can find in the Living category. Refurbished mobile devices, luxury beach tents, brand furniture, classy cutlery and servingware are just a few item categories, that you can buy at Brand Exclusive at a reasonable price, often times with a massive discount. Sub-categories include, amongst others, Bed & Bath, Kitchen & Dining, Furniture, Home Improvement & Garden, Art, and Home Electricals. You may save even more with our BrandsExclusive.com.au promo codes listed above. Australia’s first private online shopping club has been founded in 2009 by Daniel Jarosch and Rolf Weber. 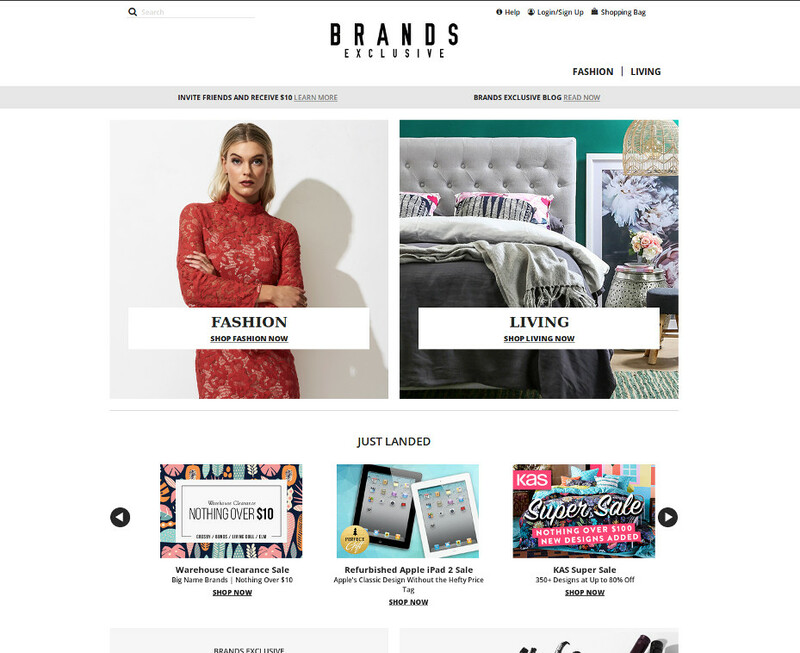 Today, the team behind Brands Exclusive Australia is part of LuxGroup, one of Australia’s largest ecommerce groups. Having offices in Sydney and Melbourne and buying offices across the world, over 300 employees strive passionately for fantastic deals from premium brands. BrandsExclusive has grown to one of the leading fashion websites in Oz.